Ocean View Terrace is a memorable property in one of San Francisco’s most exciting and desirable areas. From the parking garage, take the private elevator up to the cliff-top penthouse and marvel the panoramic view from the Golden Gate Bridge to the Ferry Building. Each bedroom has a private full bathroom. The gracious living room is complete with entertainment area and flat screen television. The living room flows into the dining area, both taking advantage of spectacular views of the San Francisco Bay and waterfront through large windows. There is a spacious outdoor terrace with comfortable seating. 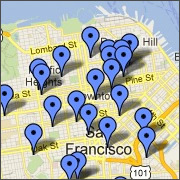 Located in the North Beach district between Coit Tower and Fisherman Wharf near Chestnut and Kearny streets.